This is an easy and delicious side dish to bake in your Caliber Indoor Range. Wash and peel the potatoes. Thinly slice the potatoes and then soak them in water for four hours to remove the starch. Drain the water from the potatoes. Melt one stick of butter and then pour over the potatoes. Layer the potatoes in a baking dish with salt, white pepper and fresh grated Romano cheese until the pan is full. Cover with heavy cream 2/3 of the way up the pan, using approximately 1/2 quart or more depending on the size of your dish. Bake at 400ºF until bubbly (approximately 30 minutes). 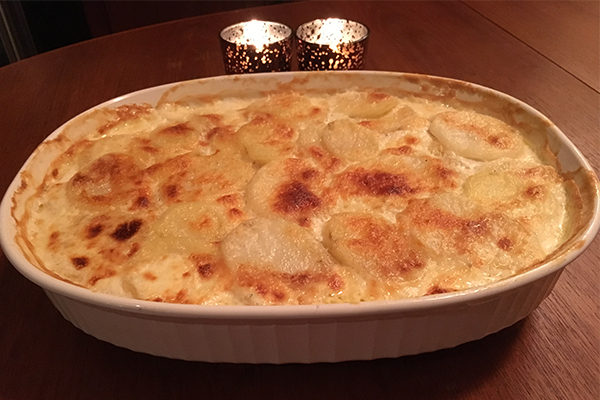 Turn down the heat to 250ºF until the potatoes are soft (approximately 40-60 minutes). If you prefer your potatoes to have a little crisp on top, broil them for an additional 4-5 minutes, but keep watch. WARNING: These potatoes are addictive, and so they are a perfect treat over the holidays!